I start tomatoes indoors to get a 6-8 week jump on the planting season. These are the tomato plants that typically produce first and go out as transplant, around the end of April. I recommended staggered plantings (for tomatoes but also other crops) so you get a continuous flow of tomatoes over the season. You can start more seeds in cups, when you plant your first transplants. Or start some plants 2 months later, for late season tomatoes. Staggering your plants not only helps manage production but also helps you manage problems. You continually have some plants ready for the garden if perhaps disease, pests or other problems damage your active tomato crop. There are two types of tomato plants. A tomato plant is either a determinate plant or indeterminate plant. A determinate tomato grows to a set height, flowers and growing slows. All the fruits mature relatively close in time and the plant dies/greatly weakens shortly after the final fruits mature. This determinate type of tomato is great for getting the first round of tomatoes from your garden (as they mature quickly) and they do well in containers. 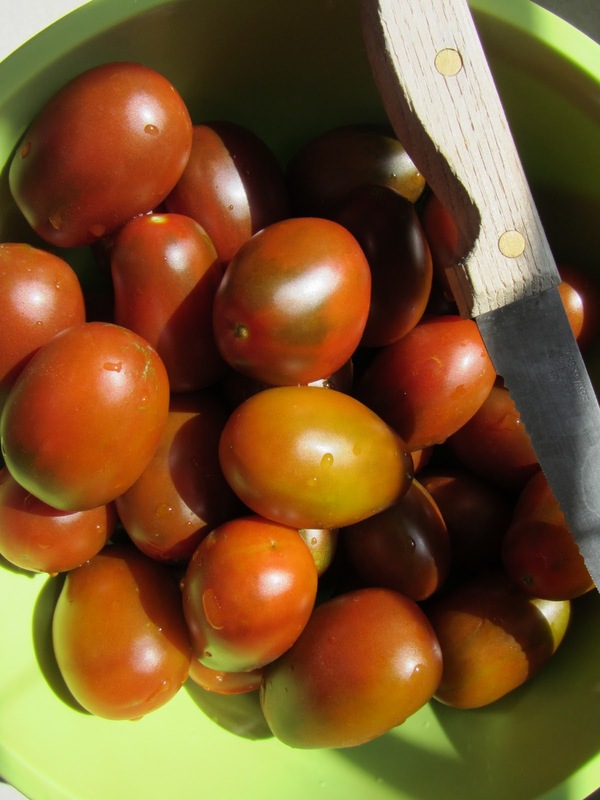 You might be able to plant two rounds of determinate tomatoes in your gardening zone. You can often plant them in April/May and again in July in my Zone. You can actually cut back a determinate tomato plant after harvest and will often begin to send out new production stems. It is like planting a new transplant. The indeterminate tomato continues to grow and grow until frost. It sets fruit throughout the season. Only frost or disease will stop an indeterminate tomato from producing. Think of it this way, a determinate tomato grows to a predetermined size. Indeterminate tomatoes often need to be staked and pruned. Determinate tomatoes need little to no pruning. You really want to grow tomato plants in a 5 gallon container as the minimum. This is a great size for determinate variety tomatoes. Indeterminate tomatoes can be grown in 5 gallon containers, as I have done it for years but a 7-10 gallon container, for them, makes it easier. The problems arise when the tomato plants get large and the heat of the summer arrives. It is possible to have to water container tomatoes two times a day during this period. A larger container helps with both feeding and watering frequency. Tomato plants needs to have air circulating through and around the plant to reduce the potential for disease. If you don't have disease issues in your garden, you don't need to do this. As your plant grows, you should pinch off the leaves nearest to the ground. I try and get to 12 inches of space between the ground and the the first leaves (sometimes more) as the plant approaches 4 feet. Now you can't do this all at once but as the plant grows taller, you should prune the bottom leaves to about 12 inches from the ground, slowly over time. Never remove more than 25% of the totals leaves on the plant at a pruning. Slow and steady pruning. This will allow air to circulate below the plant and make it harder for disease/spores to splash up on the plant from the soil. This is a space barrier. Air circulation helps keep humid air from sitting around the plant and it helps to dry the plant leaves after watering or a good rain. In the end it really helps prevent diseases. Mulching will conserve water and keep your garden beds and containers moist for prolonged periods. Two thing can happen when soil dries out. If your plant gets stressed from too little water and then you soak it, it can develop cracked fruit which is physiological issue. The plant responds by taking in large quantity of water in a short period. The tomato plumps, the skin stretches and often cracks. You see this more often with cherry tomatoes. If you continually let the ground dry and then over water the plant and let it dry and over water, you'll increase the chances of blossom end rot. Basically, the root system is damaged and the plant can get a calcium deficiency and you end up with blossom end rot. Mulching will also create a barrier between you plant's leaves and the soil. This reduces soil born problems. Soil splashing is reduced. I use shredded hard wood or grass clippings. You can but down 1 to 2 inches of shredded hardwood and be done for the season. When using grass clippings, I put down two inches of chemical free clippings and let it dry out. Never use clippings with sprays on them. The following week, I put down 1 or 2 more inches and let the clipping dry up and turn brown. I continue this throughout the summer. It is important to let grass clipping dry out before adding more. If you don't, you run the risk of developing smelly grass clippings which creates a bad smelling garden. The same fungal diseases tend to come regularly to a garden, year after year. Keep a journal and track when and what diseases come to your tomato plants and other vegetables. Maintaining a journal is a great way to know when to start preventative spraying on your tomato plants. The best way to stop a disease is to prevent it from getting established. Start spraying your plants 2-4 weeks before the diseases tend to arrive to your garden. You will be amazed at how well this works for fungal type diseases. This is on you. I have learned through experience not to spray all my tomato plants with a new spray. I've greatly damaged all my plants. Anytime you make a new spray or buy a new spray for your garden, test spray. That means trying the spray on a few leaves of the plants you want cover and waiting a full 24 to 48 hours for signs of damage. You also want to test spray when temperatures change significantly. Think spring spraying and summer spraying. A spray that did not damage when the temperatures were 70-80 degrees can damage when it is regularly 90 degrees out. The reason being is that plants often respond differently to periods of high heat. For example, you often see plant leaves wilt during these high heat periods. This is a physiological response to heat. A wilting leaf is more susceptible to spray damage. Tomatoes are vines. If you let them sprawl on the ground you will see them root from the vine that touches the ground. You will see additional vines growing all over the place and end up with a mess, if you have limited space. This often leads to more disease and pest problems. A 6-8 foot stake is the best way to train your tomatoes to grow upwards and stay off the ground. It helps you manage the plant's size and prevent diseases. You can use tomato cages or even fencing posts and string. Epsom Salt is magnesium sulfate. It supplies the micro-nutrients, magnesium and sulfur, to your tomato plants. It is OVER used now-a-days. I was guilty of this years back. It is best used as 1-2 tablespoon in one gallon of water. Water your tomato transplants when planted. Soak the leaves and the ground. A single gallon is enough for 8-12 transplants. I use the same Epsom Salt mix at mid growth when tomatoes have started to form and/or plants are over 3 feet tall. 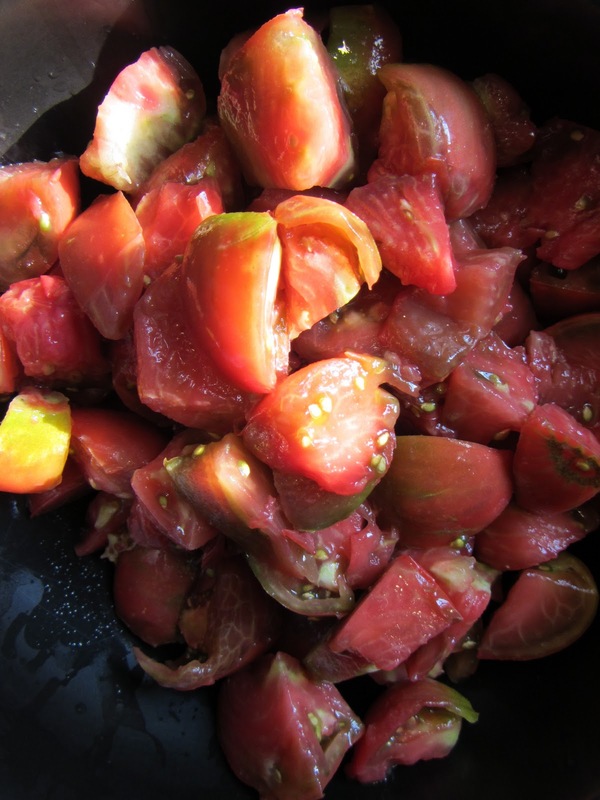 A single gallon should treat 4-8 mid season tomatoes that are 3-4 tall. I don't recommend using Epsom Salts more than this. It just isn't needed. One gallon should cover many plants. Generally speaking, plant roots absorb nutrients that are dissolved in water. Soluble fertilizers are typically the fertilizers you mix in a gallon of water. The nitrogen, phosphorous and potassium are in a soluble form that readily mixes with water. When you pour this onto to the plant's leaves and roots, the nutrients are immediately ready for absorption by the plant. They are fast acting fertilizers because the are readily available for immediate use. Leaves can absorbs some soluble nutrients. You can see results in a few days. Insoluble fertilizers are fertilizers that have plant nutrients that generally can't be immediately absorb by the plant. They don't readily mix with water. Soil life/biology must break the insoluble fertilizer down into (water) soluble components. This can take weeks or months. This is a slow acting fertilizer. Nutrients are slowly released over time. I typically use insoluble fertilizers in my raised beds as it it loaded with soil life. I use soluble fertilizers on my container plants as it has a limited eco-system of soil life. Basically you take bone meal (insoluble organic) and put it in your garden. The phosphorous in the bone meal is in a form the plant can't use. Soil microbes eat the bone meal and digest it. They break it down and release phosphorous that is now in a water soluble form and can be absorb by the plant. This process takes time. All things on the planet are chemicals. Organic fertilizers are chemical compounds that typically need to be be broken down by soil life to be ready for your plants. Fish emulsion is organic and it is rotted emulsified, in blender, fish puree. Microbes that are responsible for 'rotting' break it down for you to use as a water soluble fertilizer. In a sense it is processed. Bone meal is steamed crushed and pulverized cattle bones. In a sense it is processed. The organic fertilizers feed the soil life and your plant. That is important. The synthesized or processed water soluble fertilizers often mistakenly called chemical fertilizer are not poisonous to you or you plants. They are processed by people. In fact they are great for container plants and garden emergencies. They feed your plant but don't feed you soil life. Extreme out of control use of these fertilizers can harm soil life. But it has to be ridiculous use. You can use both fertilizer categories, in a well balanced and planned garden. The bottom line is compost is better than all the above. It is Nature taking chemical compounds and breaking them down into pure water soluble elements for you plants to thrive on. Any type of fertilizer you buy will have a number on it. It might say 3-4-6 or 5-5-5 or 24-12-24. That is the ratio of (N)itrogen (P)hosporous and Potassium (K). These elements are your macro-nutrients and the most needed for healthy plant growth. It tells you how much N-P-K your plants are getting as a percentage of the whole when applied as directed. The numbers vary greatly. I recommend trying to stay around (as close as you can get) a 5-5-5 nitrogen, phosphorous and potassium ratio when just starting to garden. That works perfectly well for all plants.You can reduce higher fertilizers number like 24-12-24 by cutting the recommended mixing dose down by 1/2 and this will lower the N, P, K ratings to 12-6-12. Ultimately we don't need to use as much fertilizer as we do in our gardens. There are tomato plants that will only grow 8-12 inches tall, like the 'Tiny Tim'. There are so many varieties that will grow 1-2 feet tall and be highly productive. They can be grown in flower boxes and hanging baskets. These are basically really small determinate variety tomatoes. Simply search dwarf tomato varieties. You don't need a lot of space. The key to your container mix is its ability to hold moisture and not just let the water run out the drainage holes. You want your mixes to have at least 50% peat moss or 50% coco coir or a combination of both. If you want productive tomato plants, the container mix has to hold water. If your container mix completely drys out for just a single day, the tomato plants is greatly damaged and production is slowed and fruits are stressed. Peat and coir are made to hold water. Heirloom tomatoes are basically plant varieties that have been around for 50 plus years. They are stable in a sense, that if you take the seeds of an heirloom tomato and plant them, you will get the exact same plant 100% of the time. Hybrids are made from crossing two tomato plants. When you do this, you don't yet have a stable plant, generally speaking. The seeds will not, 100% of the time, produce the same plant The hybridization process takes many many generations of crossing to get to a stable cultivar. The easiest way to save tomato seeds is to squeeze the seeds out into a jar and put a lid on them. Let them ferment in there for 5 days or so. This dissolve the gel that is around the seeds which inhibits germination. Rinse the seeds in a fine colander and let them dry several days on a paper towel. Once they are dry, save them in zip lock bag and they are good to go for next year. We tend to want to over love our plants with organic fertilizers, soluble feedings, rock dust, green sand, manure teas, enzymes, microbes, Epsom Salt, sprays, dusts and love them on a weekly basis with all this stuff. Well more damage comes from excess fertilizing and loving than ignoring them. 'Too much' often causes issues that look like malnutrition. When that happens, we panic, and love them more with more of the above and we kill them. Keep a feeding schedule. Don't over feed. Don't over use products. Make sure you realize filling container soil with 'so much love' will damage your tomato plant. Slow and steady wins the race and shows your plants that you love them. Does my garden have less sunlight or more shade? Growing vegetables is not difficult but it does take work and we (gardeners) at times, make it more confusing and complicated than needed. The beauty of a garden is that it wants to grow and give back to you. Nature designed plants to adapt. Even if you initially have some trouble, you will still get plenty of vegetables as you develop your skills and abilities over the seasons. The best way to grow vegetables is to start planting and enjoy learning as you go. That is what my YT channel The Rusted Garden is all about. Please subscribe and check out a few of my 800+ gardening videos. It is is important to understand the basic needs of the vegetable plants you want to grow in your garden. The amount of sunlight is a great place to start. Sunlight is, of course, needed for your plants to flourish but not all vegetable plants need the same amount of direct sunlight. Many people think they can't have a vegetable garden because they don't 8 plus hours of sun on their property. You can grow and harvest vegetables with 'Less Sunlight or More Shade' than you might have thought possible. The first thing that is important to understand is that vegetable plants want to grow and are adapted to grow within a broad range of their required needs. They can easily be placed in more than one arbitrary category for sun requirements because they are designed to adapt and do well in a range of sunlight. So the key word is range and I stressed it three times. The bottom line is to try different plants in different places of your garden. You will be surprised by what plants grow in the lower range (4 times) of sunlight and often even do better without all the sun they were getting. There is no set universal 'title' for each category of light. You will find; full sun, partial sun, partial shade, light shade, deeply shaded or shade as categories when you do research. You will find terms like direct, indirect, dappled and reflected sun. I am just presenting how I look at lighting needs for my vegetable plants, which is basically a 'range' of direct sun. Direct sun is where the sun directly hits plant leaves. That is the type of light, direct sun. I feel this is the least complicated way to identify where the heck to plant your plants... type of light (direct sun) and number of hours of direct sun (5). Vegetable plants are generally classified into 3 groups when you do research: Full Sun, Partial Sun and Light/Partial Shade. I think this is confusing as you can have Partial Sun or Partial Shade. Isn't that the same? It is like saying it is Partly Sunny or Partly Cloudy outside. The bottom line is your garden must have sun. It can be, for instance, 8 hour of continuous sun or 4 hours of morning sun and 3 hours of late afternoon sun. Because a vegetable garden must have direct sun for plant photosynthesis, I use these three 'Sun' categories below. Full Sun (6-8) is a minimum of 6 hours but the plants in this category really do their best with a full 8 hours. Of course more than 8 hours works but some plants can get beat up by intense hot summer sun, come the long days and heat of July and August, in my zone. Partial Sun (4-6) is a solid minimum of 4 hours and they enjoy a range of direct sun that covers a span of 4-6 hours. 7 hours would be okay. Minimal Sun (2-4) plants need a lot less direct sun but 2 hours is a really low. You will notice a clear difference in growth between plants that only get 2 hours of sun and the same plants that get the 4 hours of sun. The lower range of 2 hours is pretty challenging. Here are 34 plants that can do well in Partial Sun (PS) and in some cases somewhat decently in Minimal Sun (MS). A general rule of thumb is that leafy green plants used for salads can do better with less sun. I will be growing most of these plants in 2019. I have videos on garden bed design, seed starting, planting, tending and harvesting. If you would like to learn more... follow me at The Rusted Garden. The vegetable plants have active links that take you to my secure Vegetable Garden and Seed Shop hosted on Shopify.